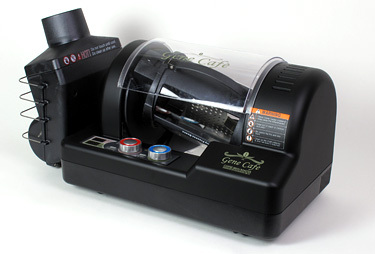 The Gene Cafe CBR-101 has established itself as an excellent roaster capable of producing about half a pound of uniformly roasted coffee. 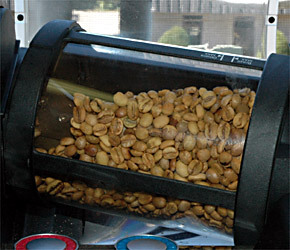 It uses a unique vortex twisting, off-axis chamber rotation which assures complete distribution of the green coffee during roasting. This motion is one of the main reasons for the roasted coffee's uniform color. 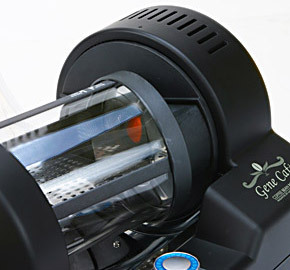 Manufacturer describes the Gene Cafe as a household or commercial coffee roaster. 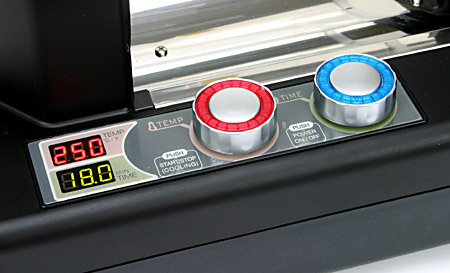 TEMP - Sets the target roasting temperature by rotating the knob. Pressing the knob activates roasting. 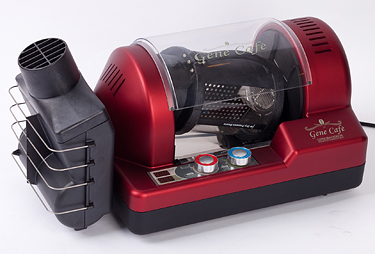 At the end of the roasting cycle the Gene Cafe will automatically go into cooling mode. However, you can terminate roasting and enter the cooling cycle by pressing this button again. Also, during the roasting cycle you can rotate this knob to increase or decrease the target temperature. TIME - Press once to turn the machine on. It will go through about a 10 second startup procedure. Adjust the roasting time as you see fit - 15 minutes is the default time which is quite right for Full City roasts of many coffees when paired with the default target temperature of 482 degrees. 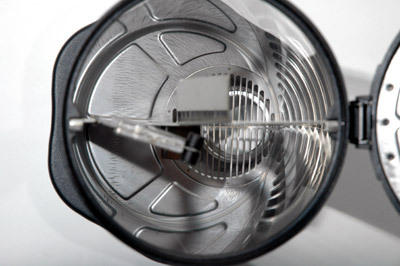 During roasting the dial can be rotated to increase or decrease the roasting time. Temperature Digital Display alternates between target and actual temperatures in whole degrees. Time display alternates between total time and countdown remaining time, in tenths of a minute. 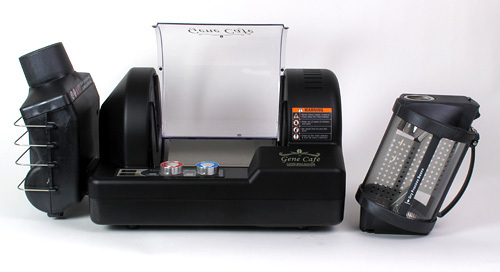 The Gene Cafe control panel. 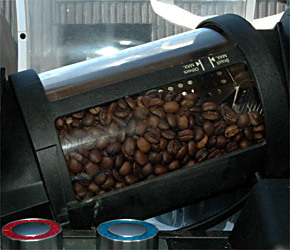 The off axis roasting chamber provides a vortex twisting motion, shown here in two of its positions as it makes a full circle. The photo on right shows the glow of the heating element. The hot air flows in from that opening and out the other end of the glass chamber. The manufacturer also calls this process 3-D Mixing. How does the Gene Cafe work? 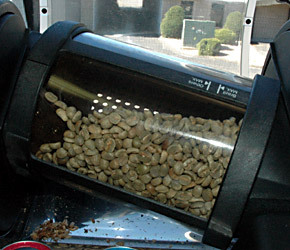 Load the roasting chamber with green coffee up to the maximum line, depending on green coffee chosen. Place chamber into grooves in roasted until properly seated. Press the blue 'Time' knob to start the machine and begin a very short startup routine. Set the desired time of roasting with the 'Time' knob. Set the desired target bean 'Temp' know. Press the 'Temp' knob to begin the roast. 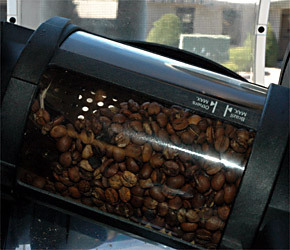 You can increase or decrease both the time and temperature during the roasting cycle. At roast's end cooling begins automatically. As before, length of cooling cycle can be increased or decreased as you see fit. 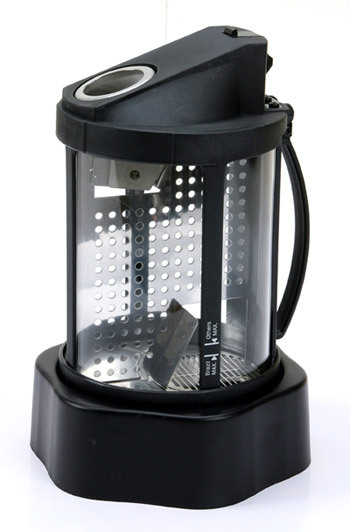 Remove the roasting chamber and empty the roasted coffee. From top left: Start of roasting cycle and progressing to completed roast being cooled. Chaff collector is also where heat stream and smoke exits. Removable for cleaning. Glass and pyrex roasting chamber shown here sitting atop the chamber stand. 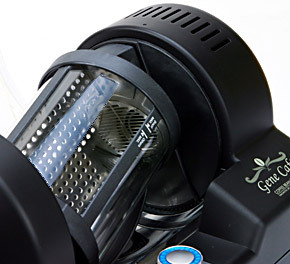 Place the chamber in the stand when filling with green coffee, for stability. Shown with protective cover raised and roasting chamber removed. Looking down into empty roasting chamber. There is a weighted, hinged part shown at 9 oclock that aids the movement of coffee as the chamber turns on its axis. 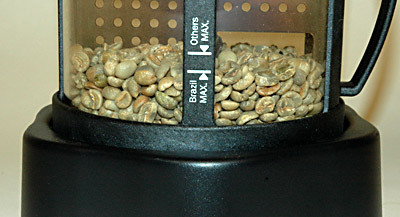 Volume indicator marks on the roasting chambing for determining maximum roast quantity of green coffee. One year manufacturer's warranty. 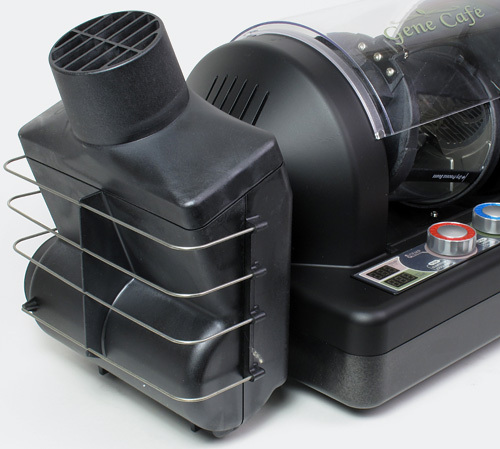 The Gene Cafe Home Coffee Roaster is warranted to be free from defects in materials and workmanship for a period of one (1) year warranty from the date of purchase.